The 309-mile Ohio-Erie Canal connected Lake Erie at Cleveland to the Ohio River at Portsmouth. A Feeder Canal connecting Columbus veered north from the main canal artery at the village of Lockbourne. Near Circleville, a massive stone aqueduct resembling a covered bridge (no longer extent) carried the Ohio-Erie Canal across the Scioto River. The first of the canal boats to arrive in Columbus in 1831 was a passenger packet with dignitaries onboard from Circleville. It is only fitting, therefore, that we welcome Steve Spicer, a canal expert from Circleville, as he explores the transportation era that rescued Ohio’s early economy. 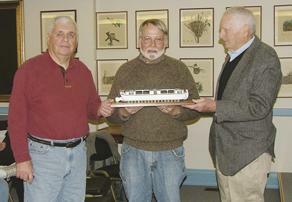 The Pickaway County Historical Society accept from Steve Spicer (center) the donation of a scale model, hand built canal freight boat. Two original handcrafted wooden models of canal boats that Steve built are on display at the Pickaway County Historical and Genealogical Library (210 North Court Street, Circleville).